1. Money breeds power; power breeds evil. This is a dark book, for any of you who did not gather that from the summary, but don’t let that daunt you. Even still, this deals with themes like money, power, and chaotic/direct evil intent. In order to get into the elite school, Cania Christy, one has to pay an outrageous amount of money and/or possessions in order to get in. This alone strikes me as such a true and interesting theme in life in general. Money and possessions breed power (hence all the school’s makeup consisting of rich kids), and that power breeds evil, leaving destruction in its wake. I have to give kudos to Wiebe for tackling this theme. It’s a challenging one to pull off, but I feel that her characters are perfectly crafted to carry out these themes, not only that but she makes them human, begging the question: Are all humans capable of such deeds when power is involved? The first thing that tipped me off to the Faustian theme was the price the parents had to pay in order to get their kids into Cania, that and the contracts signed in blood. I was thoroughly impressed with this theme as well. I can’t go into extreme depths for fear of giving away the last 40% of the novel, but I will say that her use of literature and literary references throughout this book was impressive. I studied English at university, so of course all the works she referenced and/or included were very nostalgic for me. Even further, she used them with care. It is not like Cassandra Clare’s The Infernal Devices series where Clare throws up literary references so consistently that the reader wants to strangle her. It is tastefully placed and only exists because it furthers the plot. Which, in my opinion, is the best way to go about it. 3. Voice, characters, and cultures. 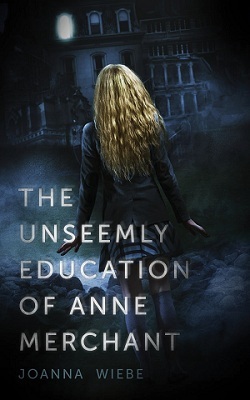 The Unseemly Education of Anne Merchant is written in first person POV present tense. Those of you who follow my reviews know that I detest first person POV alongside present tense, because most of the time it is not executed well. This book is one of only three books/series that has pulled this off. So take notes authors; this is the way to do it! Anne Merchant’s voice is so very clear in Wiebe’s writing. Her inner dialogue is fantastic and realistic. As for the dialogue, there were points that I could tell who was talking even before she referenced them —just by the words they spoke, I could identify the character. That alone screams excellent character development and well executed writing. Piggy-backing off of the characters, I was impressed that she had such a variety of characters hailing from so many different places including: Italy, Thailand, Canada, and Mexico. The only negative thing I have to say (which is very minor, I might add) is that she pulls on stereotypes a little too much when it comes to Harper, who is from Texas. Originally being from Texas myself, I found it slightly annoying how she always added a southern adage to her dialogue. Other than that, I actually didn’t mind Harper’s character as much as I thought I would (since at first I found her the cliche Queen B). Otherwise, I absolutely loved Wiebe’s voice and characters. Overall, I enjoyed this book immensely! I was already very excited about it, because the summary seemed to remind me of The Unbecoming of Mara Dyer by Michelle Hodkin. And just like Hodkin’s book, I was not disappointed at all by this wonderful debut novel. I read it in less than 24 hours, and I don’t regret a single minute! I full intend to get the second one whenever she decides to release it, and you can count on the fact that I will go buy this book in hardback and add it to my bookshelf. Your review makes me what to read this book! Sounds very interesting.